Are you ready for apps on your TV? 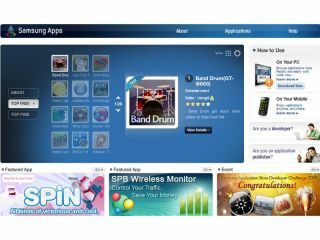 Apple's app store concept is certainly taking hold in other areas of the consumer electronics industry, with TV manufacturer Samsung announcing a centralised app store for its various mobile phones, TVs and other consumer tech devices. The downside is of course that you will have to 'live the Samsung lifestyle' (or whatever other marketing slogan they decide to brand it with) in order to get the best use out of it. Despite that, we have to admit that it is a canny idea – being able to use the same app on your phone, your TV and, potentially, your fridge in the kitchen! Samsung Apps is basically a major expansion of Sammy's Internet@TV service which was launched for its range of online HDTVs in 2009. Watch out for the first free apps later this spring and then the paid-for premium apps later in the summer. For more head over to the Samsung Apps website.